For applications created in releases before V6.1SP2, you can use the new Case Type Definition gadget to create formal case and task hierarchies from existing work types. Pre-requisite: All work types that need to be formalized as case types must be derived from the Work-Cover- class. Otherwise, they can only be treated as tasks covered by another work type that has a Case Type rule defined. If you have imported in an existing application into a 6.1 SP2 system, you can access the Process & Rules > Case Management landing page and Case Type Definitions gadget to see your existing work types. Work types are grouped by work pool, and the work types in your application will likely all appear in the Other grouping when there are no case type rules defined for those classes. Add the work type that is to become the top-level case directly to the work pool by right-clicking on the case type and choosing Add from the context menu. At the dialog, select Use Existing and specify the top level work type. This automatically creates a case type rule for that work type. It appears as a top-level case under its work pool. At this point, you have a single case type rule defined, with no coverable work types yet. 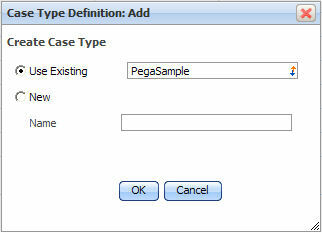 Right-click the top-level case and choose Add, with Use Existing, and add subcases or tasks to that top level case. The result is a formal case type structure with one top-level case containing two subcases. Each time you use Add > Use Existing, the system automatically creates a case type rule for that work type and adds a reference to that work type in the parent case type's Coverable Work Types list. New subcase and task types default to Automatic instantiation when added to a parent. This means that when a work object of the parent case type is created, the application will automatically create work objects for each coverable class, and then start their starting flows. As this may not be desirable for an existing application, specify that the Instantiation settings for a case's children are related to your application. New subcase and task types default to Required when added to a parent. This means that the parent work cover cannot be resolved until all the covered items of that type are resolved. As this may not be desirable for an existing application, specify that the Required settings for a case's children are related to your application.